When you’re looking for a removal company to move your belongings safely from your old home to your new home, you’re looking for house movers that are professionals. Probably you have heard tales of cowboys who throw boxes of china around without any care for the contents, or who ‘lose’ your belongings en-route to your new house. Worse still, they’re often not properly insured. As for the damage they can do to your flooring – well, it doesn’t bear thinking about. Although vinyl, wood, tiles and other surfaces can all pick up considerable damage, it’s your carpets that will bear the brunt, with dirt and worse tracked into your house and ground into the pile. If you’re expecting a deposit back on your old property, cleaning up the mess will at best account for a large chunk of your money, and at worst, mean you see nothing back at all. Additionally, you might be able to control most elements of your moving day, such as getting a good team of house movers at a fair price, making sure you’ve got the keys to your new home, and knowing which box the kettle and mugs are in, but there’s one thing you can’t plan for in advance – and that’s the weather. Even if your moving day is in the middle of summer, a torrential downpour can turn a manicured lawn into a muddy bog in minutes, and even if your movers are accessing your property via a paved area, they’re still tracking dirty, wet footprints across your carpets – both in your old home and your new property. Unless you want to welcome yourselves to your new home by getting a team of professional cleaners in, you need to find a solution (although if the previous tenants in your new home haven’t left the carpets as clean as you would like, we offer that service too – just ask us for a quote!). Our professional, fully-trained house movers offer the best solution. 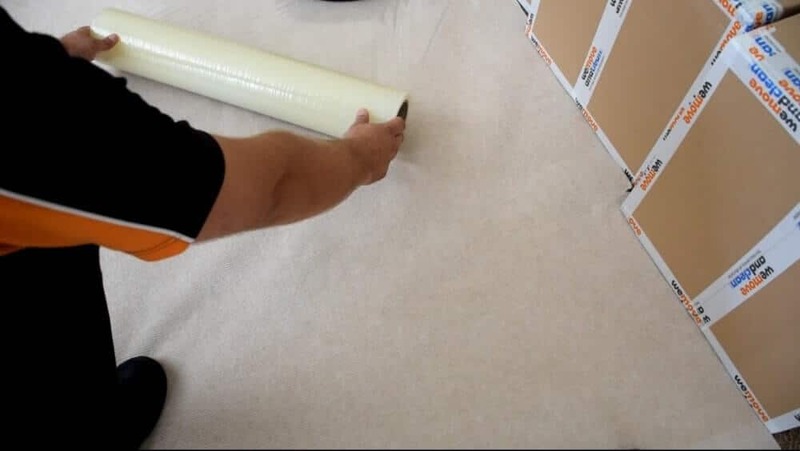 They take care of your carpets at both ends of your move by wearing protective overshoes over their outdoor work shoes to protect your carpets, and to stop tracking dirt into the house. As an alternative – or even in addition to the overshoes – they will use a carpet protector as an extra layer of security. Rather than looking like they’ve had a team of removal men walking up and down on them for an hour or so, they will look just the same as before! We’ve left the best news until last, of course; we offer this service as standard, and don’t charge extra for it, unlike many other removal companies. Your peace of mind on moving day is always our first priority, and we pride ourselves on caring for your property as we would for our own. At We Move And Clean, we’re not happy unless you’re happy, so if you’re moving house soon, phone us for a quote today or head over to our main carpet cleaning page to read more – WeMoveAndClean.co.uk/Carpet-Cleaning/.